The state of our waters is a hot button topic. Water quality has become an election issue from Southland to Northland, from towns to nation, and it is often in the news. Swimming water quality and implications of the proposed Ruataniwha water storage and irrigation scheme in Hawke’s Bay are cases in point. Sediment plume from Hinemaiaia Stream into Lake Taupo (D. Rowe). What is at stake varies from place to place, but in general it is our health, wealth and well-being, which include industrial activity and the environment’s natural character and ecosystem services. These high stakes are reflected in public surveys. 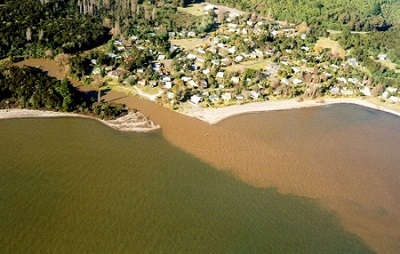 In a 2010 report from Lincoln University, water pollution and other freshwater issues were identified as the most important environmental issues facing New Zealand. While respondents generally thought our waterways were at least in adequate condition, rivers and lakes ranked the worst. And in terms of meeting our “clean, green” image, a 2013 report by Horizon Research found that addressing river and lake water quality topped the to-do list, followed by farm runoff and industrial discharges. The ‘Dirty Dairying’ campaign mounted by Fish and Game NZ in 2002 no doubt help prime these opinions, while the catch phrase remains in use to this day. But land and freshwater practices are also changing. The campaign was followed a year later by the signing of the voluntary Dairying and Clean Streams Accord between Fonterra, regional councils, and the Ministries for the Environment and of Agriculture and Fisheries, which high-lighted a to-do list for farmers. The 2003 Accord was succeeded by the Sustainable Dairying Water Accord in August 2013, this time a mandatory agreement involving all dairy companies. Given the nature of the debate, then, it is no surprise that the messages we receive via the media may be as muddied as the rivers or estuaries we’re trying to protect. Is the Manawatu River one of the dirtiest in the world? Are we “100% Pure”? The importance of these questions and the complexity of the science behind them led the Parliamentary Commissioner for the Environment to produce a report in 2012 on the main concerns of water quality – pathogens, sediment and nutrients – and why they are concerns. It was designed as a guide to the complex science for the public and freshwater professionals alike. But so much of the important science and management frameworks are out of reach from the public, even from many of the freshwater professionals ourselves, either because they don’t know where to look or don’t have the background to fully make sense of it. What would be valuable, and somewhat lacking in New Zealand when it comes to freshwater issues, is a communication middle ground – an open forum that fills the gulf between what we hear on the radio and what we hear at a conference. On the one hand this would benefit the public as more and more people engage in collaborative decision-making. On the other hand, freshwater professionals would also benefit as they make their research or policy planning more interdisciplinary. What is the state of our freshwaters? And what could or should we do about it? Articles will range from measurement to management, with two or three articles published each week from October to December. So stay tuned, subscribe, and take part in the discussion. I am not sure the PCE report explains “why” well. I believe ‘why’ requires us to put water quality in context. The PCE does this poorly IMO. eg What was our likely pre-settlement water quality and how do we now compare. The PCE contains plenty of anecdotal evidence but little numerical. That is a very muddy, grey, unclear, issue. We have one scientist lined up to talk about the use of models in general, and I’ve specifically requested he mention OVERSEER, but there’s more to water quality modelling than this model so I didn’t want to exclude others. Excited to read the commentary and wider discussion over the coming weeks. I’d be interested in the experts’ take on the latest changes to the RMA(A) and how changes to notification thresholds might impact on community engagement and goodwill around freshwater management. Grateful we have the longitudinal study of environmental perception so we can track the effects on people’s perceptions, in light of a changed legislative regime for water infrastructure development. Hi Robyn. Alas the RMA changes won’t feature much in this series. They would have been (and were) more fitting in Waiology’s previous series on water governance, though as the changes were only proposals at the time any discussion was limited. But you raise a good point – perhaps next year I can gather a few articles on the implications of the changes for freshwater. Don’t get me wrong. I think Overseer is a great learning/management tool. But as a compliance tool I simply view it as completely unsuitable. With a 30% variability I would challenge any environmental leader to convince me otherwise. The argument “it’s the best we have” is clearly not acceptable. If you agree with me I would challenge you to make your voice heard. Without it in the near future we could be judging and punishing farmers with a blunt club. Mike thanks very much for your link. good to see this forum establishing. Check out the wainz.org.nz website that is an open data collection site that aims to show pics of fresh water pollution from around NZ. Th site together with phone apps and drone surveillance air craft have been developed by the school of science and computer engineering students at Victoria University in conjunction with the Wainz group.